With the best quality cleaning products and techniques at our disposal, Best Clean Carpet Cleaning will deliver superior results, working our magic on everything from upholstery to grouting. We’ll also save you valuable time, leaving you free to get on with the things you really want to do. Best Clean Carpet Cleaning was established in 2007 by Petr Skvaril, who spotted a gap in the market for a premium cleaning company in his home in north-west Tasmania. Emphasising the local aspect of his family-run business, and the commitment to providing quality services, Petr has built up a reliable reputation over the years. Best Clean Carpet Cleaning is now one of the most recognisable cleaning brands in the area and has grown from being a one-man operation to a multi-van business. With a huge assortment of specialised equipment unique to Best Clean Carpet Cleaning, we can deliver a full range of professional cleaning services that give guaranteed great results. Comprising of Petr, his wife Odessa and son Jacob, and various other local cleaners, Best Clean Carpet Cleaning offers onsite inspections and free quotes for all jobs. Best Clean Carpet Cleaning specialises in a range of professional cleaning services for carpets, tiles, upholstery and more. 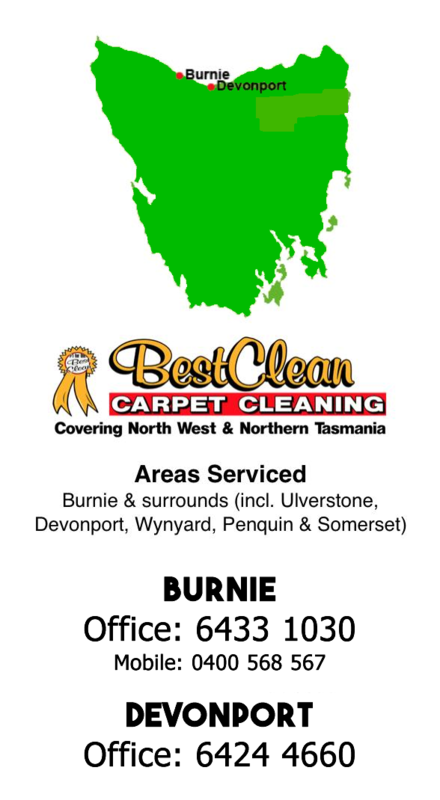 Based in Burnie they cover the north-west and west coast of Tasmania – from Devonport & Burnie in the north, to Smithton in the north-west. They also service the west coast in Queenstown, Strahan, Zeehan and Rosebery.